And a revolution it was. The latest tapas restaurant to open their doors in the new Grey’s Quarter of Eldon Square is a funky, friendly and upbeat little number. 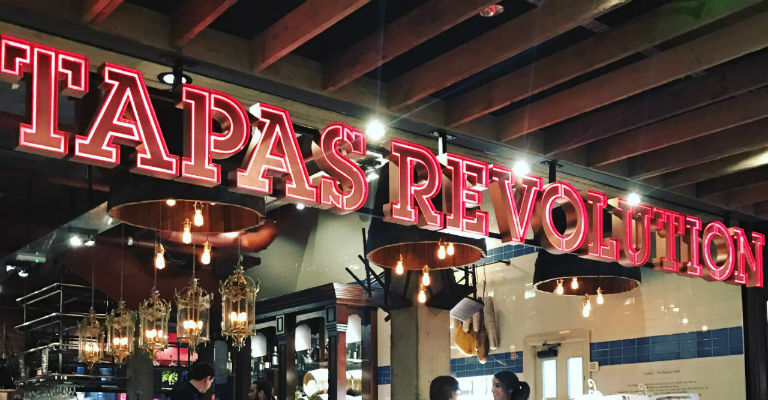 From the moment we arrived, the staff at Tapas Revolution made us feel entirely welcome. Greeted with menus and a smile we were seated in a cute little booth at the front of the restaurant, where we could watch the world (or shoppers) go by. Before I was even tempted by the food menu, I heard the word gin. 2 for 1 gin in fact. Champion. 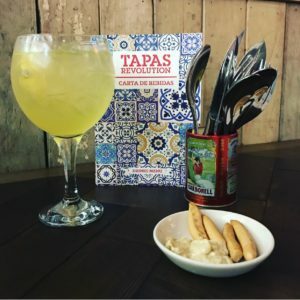 Tapas Revolution serve a good selection of premium, Spanish gin and tonics. Most, I’ll admit, I’d never come across before. So, naturally, I was in my element. After serious deliberation I chose the Limoncito, a homemade saffron lemonade with Larios 12 gin distilled in Malaga. You can also have this refreshing tipple with an Element 29 vodka, if you’d prefer. My drink arrived in a balloon glass, filled with ice. It was light and smooth, with a good tang form the homemade lemonade. If you love a little something on the bitter side, I highly recommend this. There was a good choice of Spanish influenced cocktails, too, all classic numbers with a twist of Spanish ingredients. And sangria. Who doesn’t love sangria? After indulging in the gin goodness, I turned to the food. 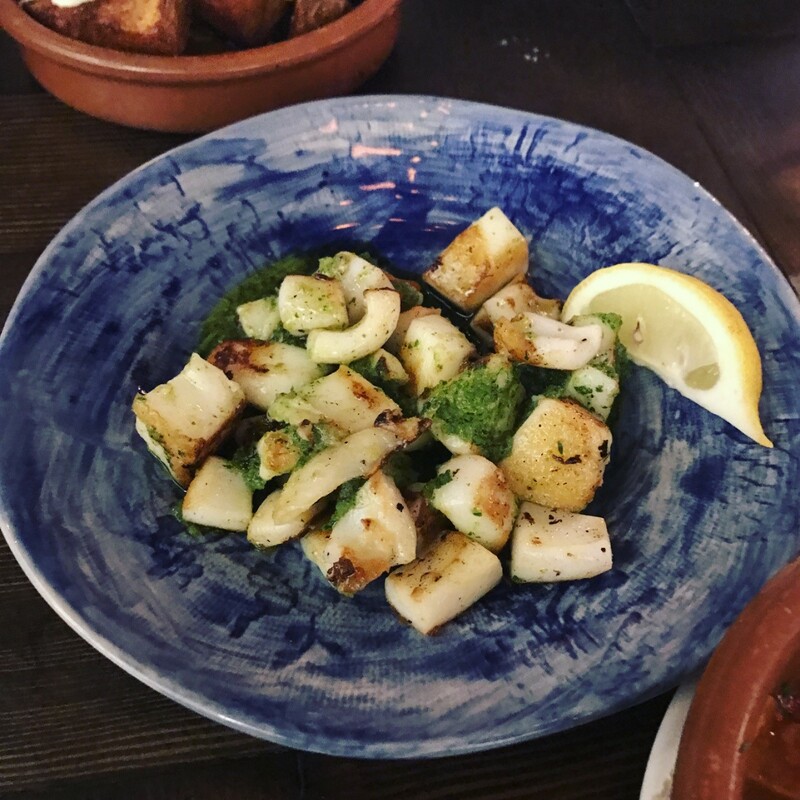 The menu is extensive; not intimidatingly so, but there’s a really good selection of meat, fish, breads, cured meats, vegetables, paella, sharing platters, set menus… very much something for everyone. A lovely Spanish waiter arrived to explain the menu. He was very informative and knowledgeable about the different dishes, their origins and ingredients. He recommended us a few dishes and left us to decide. 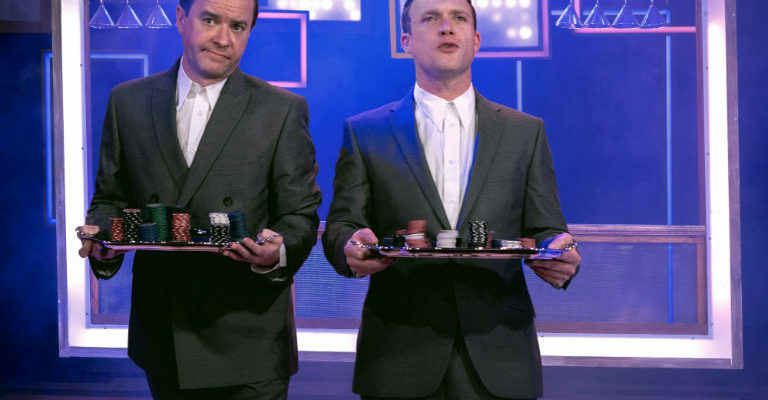 Whilst we did so, we were brought a little teaser. 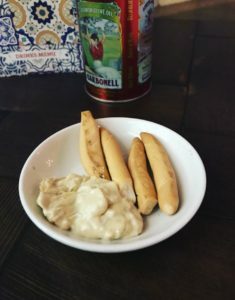 Four small, thin breadsticks with a goat’s cheese and onion marmalade concoction for dipping. I could not get enough of the tapenade; the strong goat’s cheese taste was present but the sweet onion marmalade softened the intense flavour. A perfect combination. 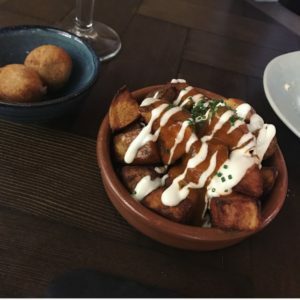 I always underestimate tapas, and what do you know? I did it again. We ordered an abundance of dishes, trying to get a taste of everything and ensuring we had some Spanish classics in there too. The lovely waiter assured us we’d made a good selection. It took us long enough. The Ibérico Mixto was a mixed platter of cured meats with hand carved ham and chorizo Ibérico. 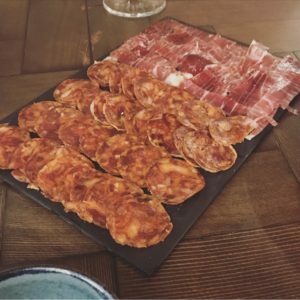 It was a good portion with strong, smoky flavours and a gentle kick from the chorizo. 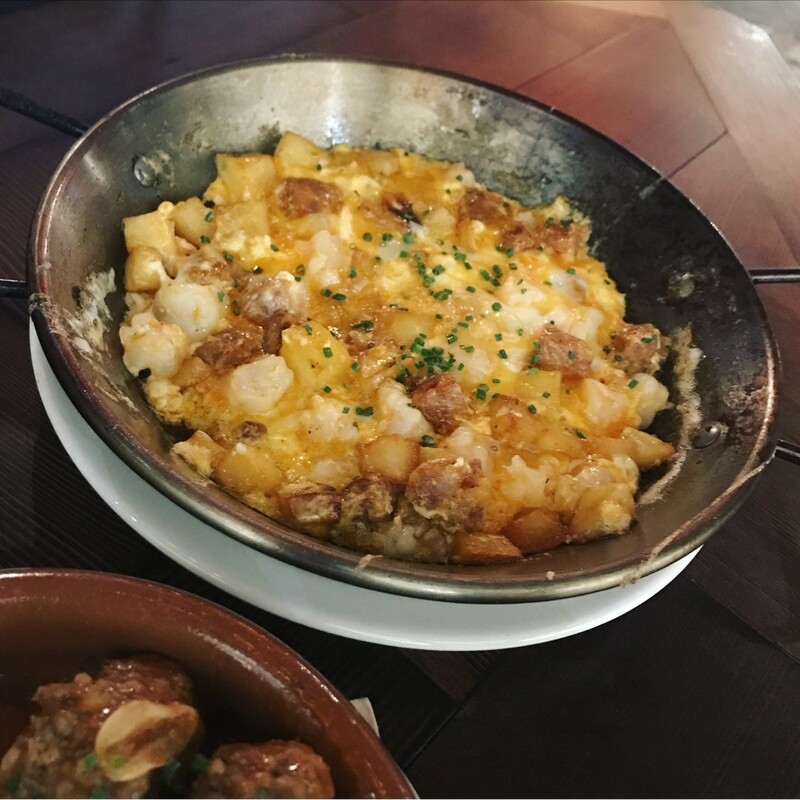 We incorporated the meats in with our other dishes too, such as the Patatas Bravas, complimenting them really well. The Patatas Bravas were crisp with a generous amount of a rich and spicy tomato sauce that was soothed by a topping of aioli. 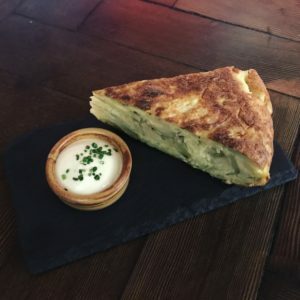 A portion of aioli also came with the Tortilla de Patatas. A strong yet creamy garlic dip then was perfect for the thick and flavoursome Spanish omelette. Now and then, you’d get a mouthful of gooey cheese, a wonderful little surprise. Then came the croquettes, possibly my favourite small plate, although I can’t be completely sure. 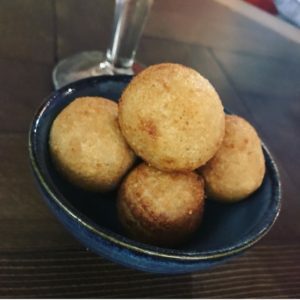 Deep fried Ibérico ham oozed with a sweet béchamel sauce; the ham had such a complex flavour that goes hand in hand with such a mellow ingredient. Now, this is what makes the decision about my favourite dish so very difficult: the Albóndigas en Salsa, or soft, beef meatballs in a vegetable enriched tomato and white wine salsa. The meat was succulent and seasoned perfectly. I ate every last drop of the salsa too. The Huevos Rotos con Chorizo y Gambas sounds really fancy, doesn’t it? Well it’s basically just chorizo, prawns and baked eggs. But, it’s not that basic – it’s actually really tasty. It certainly wasn’t my favourite dish, as I felt there wasn’t quite enough chorizo in there, but it I still had no serious complaints. Finally, there was the Sepia a la Plancha, one of the dishes recommended by the waiter. And am I pleased he did. This dish was based around cuttlefish, something I’d heard of, but not very often and seen on menus even less. Cuttlefish has similar texture to squid, but thicker and much meatier. 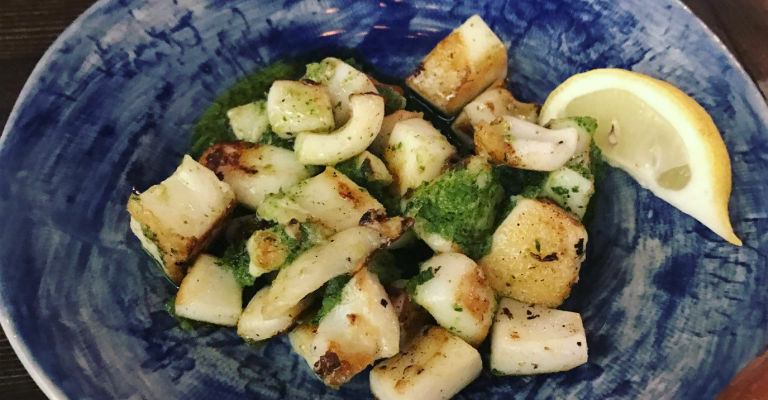 It still has that rather chewy consistency, but if you like squid or calamari, you’ll love this. Cooked on the griddle with garlic, parsley and extra virgin olive oil, you can taste the crisp flame on the fish. It was salty and complemented the parsley dressing so well. I would most definitely order the dish again, if I ever came across it. The portions were sizable and very reasonably priced, especially when teamed with such fantastic service from a friendly and funny waiter, who told us tales of his family and hometown in Southern Spain. I’ll without doubt return, even if only for that cracking gin number. One thing I’ll definitely say, is listen to the recommendations, try something new and go out of your comfort zone. You won’t regret it. 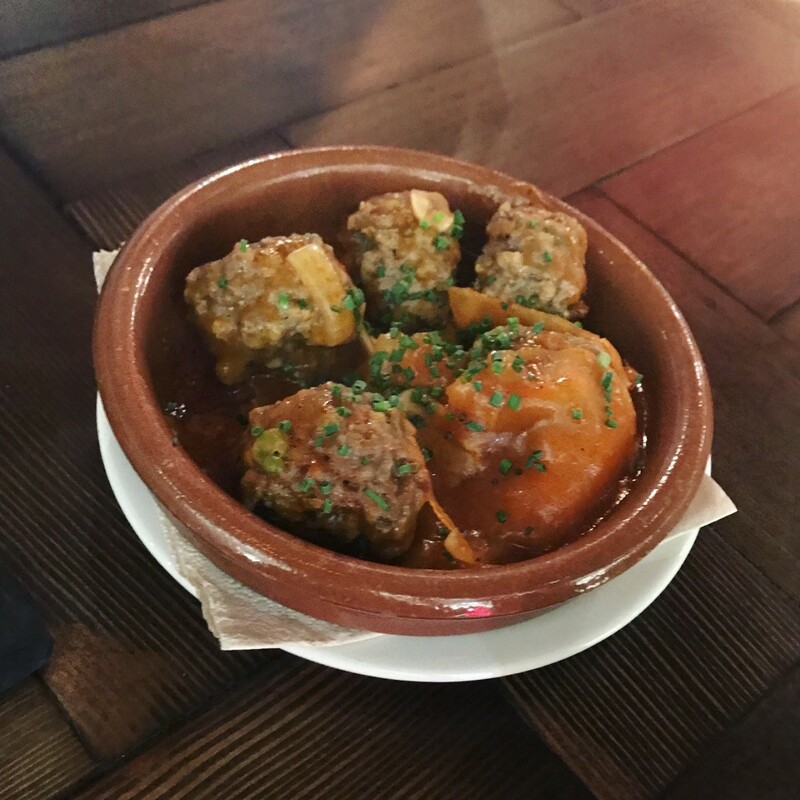 As Tapas Revolution owner and Spanish TV Chef, Omar Allibhoy says, “food and life are always best shared.” Until he nicks the last meatball. Then there’s furore. 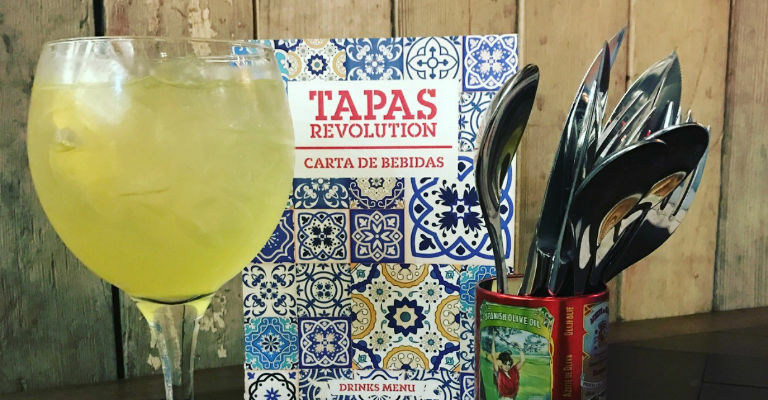 For more information about Tapas Revolution at Eldon Square, Newcastle, visit their official website. See more of Laura’s photography from the night below.